When I decided to write about Valentine’s day, the first thing that came to mind were the cards received by dear ones from their sweeties. 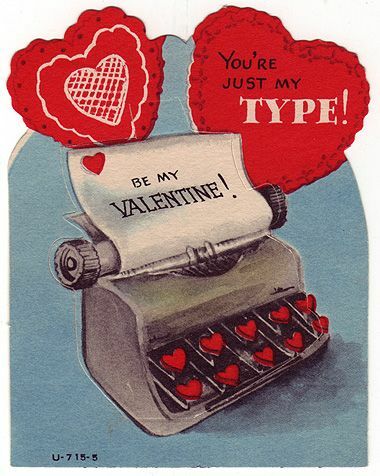 Then it was the old, vintage cards I love to see on ephemera pages. That called forth the decorations I’d pile on a shoe box every year, in hopes it would outshine other classmate’s and be brought home bursting with cards. Yep, I was a sucker for Valentine’s Day. But I’d never really researched its origins. And there are a few stories about it. The most popular was one I ran across on several websites, one being The History Channel’s. Legend tells of a third century man in Rome. Claudius, the emperor at the time, decided single men made better soldiers so he made a decree that no soldier could marry. Valentine (or Valentinus) secretly married soldiers and their sweethearts. Once found out, he was executed for defying the emperor’s orders on February 14th and became a saint thereafter. Another tale tells of Valentine, imprisoned for either helping Christians escape Rome or for marrying the soldiers, writing a letter to the woman he loved (the jailer’s daughter, no less) and signing it, Your Valentine. While the legends are steeped in mystery and will never be confirmed, it’s clear St. Valentine’s actions took hold of the imagination of the world. While Valentine’s Day is celebrated on different days worldwide, it’s on February 14th here. If you have a Valentine, give them a kiss and a hug, instead of or in addition to the candy or flowers. And don’t forget the card! I’m enclosing one for all of you. Happy Valentine’s Day! Previous Previous post: Food, Glorious Food!